Who are you? I am a lot of things, a filmmaker, painter, gym obsessive and writer. I am obsessed by ‘personas’, so I am many different people. But not a ‘career’ driven person, and never a ‘square’. But I make money from manufacturing collectible dolls. Why Broadstairs? I still have a flat in London, but for me, down Thanet way, it’s got to be Broadstairs. Utterly unpretentious British seaside town with a gorgeous front and great people. How do you define style? Well, you either got it or you ain’t. It’s the effortless ability to make things work without labouring over them. If you were an animal, what would you be? I’d be a Fox, because I’ve been told I look like one. And I like their bushy tails. Or maybe a wolf. Object of desire for your home? Oh, I don’t think like that. Any old thing can inspire me, the tattiest piece of old kitsch can lead to a whole plethora of new ideas. Actually my ideal for living is just one grand room with a bed in the middle, albeit a gorgeous one, with a good chandelier above it. The ideal kitchen being a coffee table with a coffee maker and toaster on it by my bedside and everything else just chucked on the floor, like the children in Cocteau’s Les Enfents Terrible. Oh, and a nice fireplace…I had a room like that once and it was perfection. If you could go back and live in another era from a design point of view, when, where & why? Oh but you can recreate anything now, can’t you? But a lovely, decadent, late 19th century look in lavender and yellow where one could sit reading Rimbaud and eating opium and laudanum could be rather good. What would you do if you were Mayor for a day? Give everybody £1000, like the Australians did. What building would you like to be locked in overnight? Harrods food hall, so I could scoff all the beluga all night! Where do you go for a nightcap? I am rather partial to the Broadstairs Bijoux Hotel, which is a gorgeous little drinking club here, elegantly decorated and frequented by some great characters. in the day I go to Graham Wards tea room, ‘Oscars cafe’, on Oscar rd. What would buy if you won the lottery? I’d Blow the lot on making a film. And on manufacturing dolls without ever having to worry about making a profit out of them. What do you collect? I’ve been a doll collector for almost 30 years. 1950’s and 60’s dolls are a passion, and my great chum and business partner, Liz Lee and I manufacture our own pastiche versions of them. Who are your heroes? As I child of Punk I had no hero’s. But I admire Guy Debord for his politics, Patti Smith for her poetry and music and Pasolini for his genius filmmaking. But my true Hero is Fassbinder. He combined it all and burnt himself out by the age of 38. He sacrificed himself for his work. He was a true genius. How much work have you had to do to your home to make it your own? In the past, with other houses, I have laboured like a dog. With this house hardly anything, everything flowed naturally because it was ‘meant to be’. But my good friend Kapo, who is an unsung local hero, did the difficult stuff. First Thanet memory? Coming down to Ramsgate with my friend Liz …and HATING it! But I like it now. Favourite space in your house? My lavender bedroom, a portal to calming dreams. What couldn’t you live without? My health and true loyal friends. Materially I value nothing. If you could change one thing about your house what would it be? Nothing at all. It is perfection for me. I fell in love with it the very second I saw it. In 10 years time where will you be? Life is an endless sea of possibilities and no one knows what the future holds, but somewhere surrounded by beauty and SUN. In perfect health, with people I love, that is the essential thing. And with MONEY. Best advice you’ve been given? Hold fast to that which is good. What are your goals for 2013? To manufacture our new doll, by hook or by crook! ROUND UP: Julian lives in a chocolate box Georgian cottage hidden away from the road. Inside music from yesteryear plays on the dansette and the smell of coffee fills the house, smell & sound unfortunately I cannot capture, but the effect? Warm, welcoming & immediately relaxed. 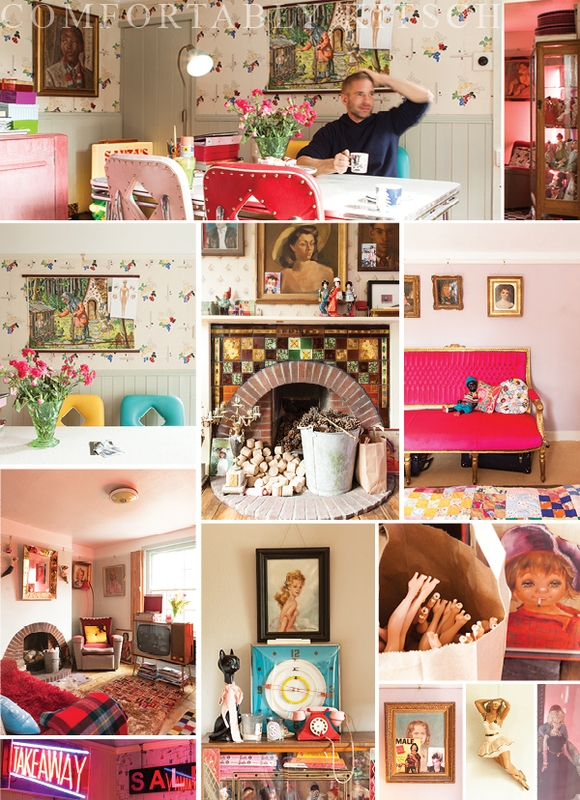 Muted shades cover the walls & a collection of beautiful hand printed vintage wallpapers, offset by the occasional shot of neon and statement pieces in hot pinks, reds & turquoise’ & more. 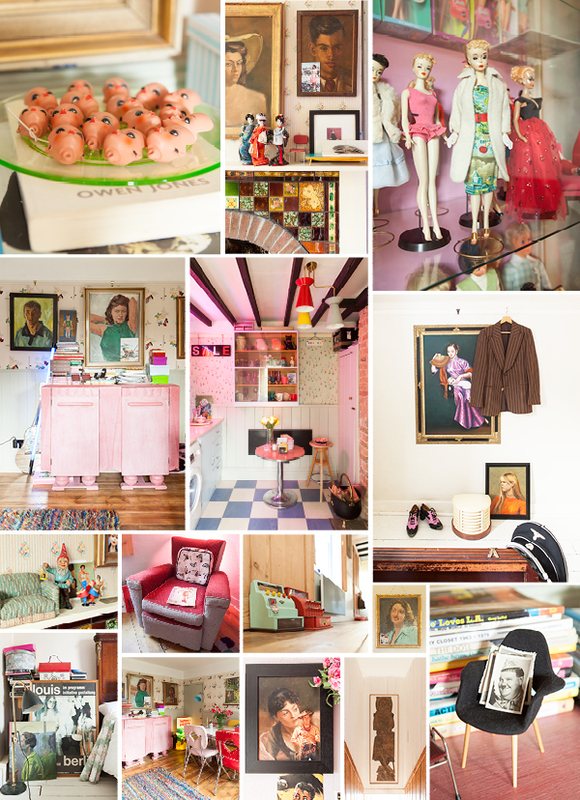 This house is comfortably kitsch with a pinch of punk & a shot of glamour. Salon Bohemia Broadstairs, 1 John Street, Broadstairs.